Define the architectural concept of resilience and explain its implications for occupant safety and building durability. Discuss how material and framing system selection can impact resilience and health, safety, and welfare of occupants in the built environment. List the attributes of framing materials that contribute to resilient framing systems and building performance. Compare the durability, strength, and combustibility characteristics of structural steel and other common framing materials. Resilience is the ability of an object or system to absorb and recover from an external shock, such as those caused by natural disasters (earthquakes, hurricanes, tornadoes, wildfires) or malicious acts (arson, terrorism). 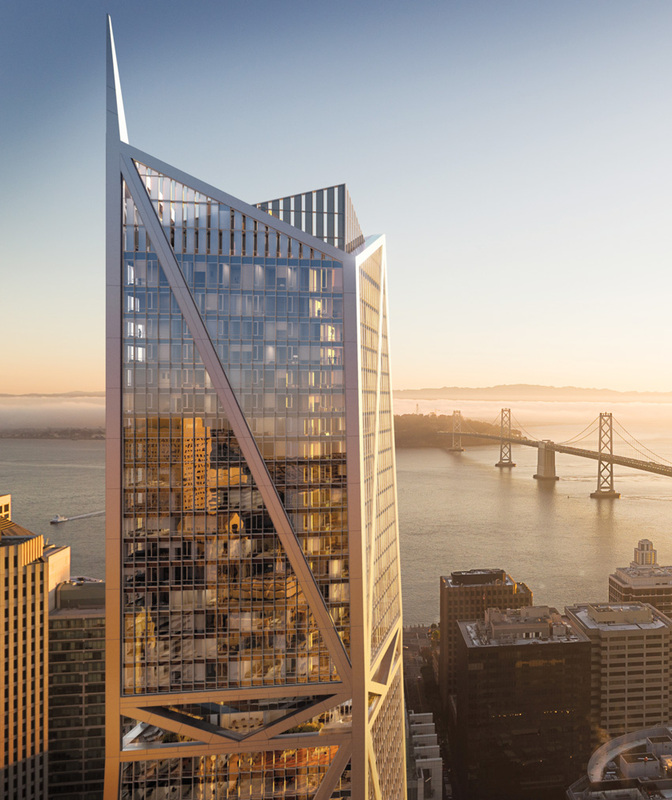 Often referred to as the “most resilient skyscraper on the West Coast,” 181 Fremont in San Francisco utilizes external megabraces to resists shear demands in the office levels and standard buckling-restrained braces in the residential levels. While the primary purpose of building codes is to protect the health and safety of occupants during an extreme event, the design goal of a resilient structure is for it to withstand an extreme event with minimal damage. By doing so, the building will be able to maintain continuous function or be quickly repaired for a rapid return to service. Resilience is a simple concept, yet it has complex implications for designers and builders. For some, resilience is viewed at the community level and refers to a community’s ability to absorb and recover after a disaster. This could be measured by the ability to restore energy, transportation, clean water, and communication services to residents quickly after a disaster. As illustrated in the graphic below, communities become resilient by having an infrastructure, which includes buildings, that can withstand intense storms or disastrous events. Facilities such as fire, police, health care, government entities, and designated shelters or residential units are of key concern for community resilience. To enhance community resilience, key decision makers must begin by selecting structural framing materials that can efficiently and effectively be used in the design and construction of resilient framing systems for critical structures. When measured against other framing materials, structural steel clearly satisfies those requirements. Community resilience is dependent on the resilience of multiple community assets. The resilience of a community, building, or material is often characterized by four interconnected Rs: robustness, resourcefulness, recovery, and redundancy. Robustness at the community level refers to the ability of critical services to maintain operations during and after an extreme event. Buildings that house vital services such as health care, power management, transportation, and communications must be able to maintain operation for a community during and after a disruption. For a building to be resilient, it also must be robust and able to withstand or recover rapidly from the extreme event. The building’s robustness is a function of the integrity of the structural frame and, in turn, the strength of the framing material used in that frame. Resourcefulness is the ability to prepare for and skillfully respond to a crisis or disruption. For a community, that means not only having contingency plans in place but also identifying and providing the resources needed to implement those plans. For a building, it means having as-built building plans available for rapid reference, structural engineers identified who are prepared to provide a rapid assessment of damage to the structural frame, and sources identified for materials that may be required to implement a repair. For example, structural steel is stocked at hundreds of steel service centers throughout the country for rapid delivery to a structural steel fabricator that can quickly fabricate the members required for the repair (see MacArthur Maze sidebar). The rapid reconstruction of the macarthur maze illustrates the benefits of resilient design using readily available resources. The MacArthur Maze is a large freeway interchange at the east end of the San Francisco-Oakland Bay Bridge. On April 29, 2007, a tank truck carrying 8,600 gallons of gasoline overturned and caught fire beneath one of the ramps of the interchange. 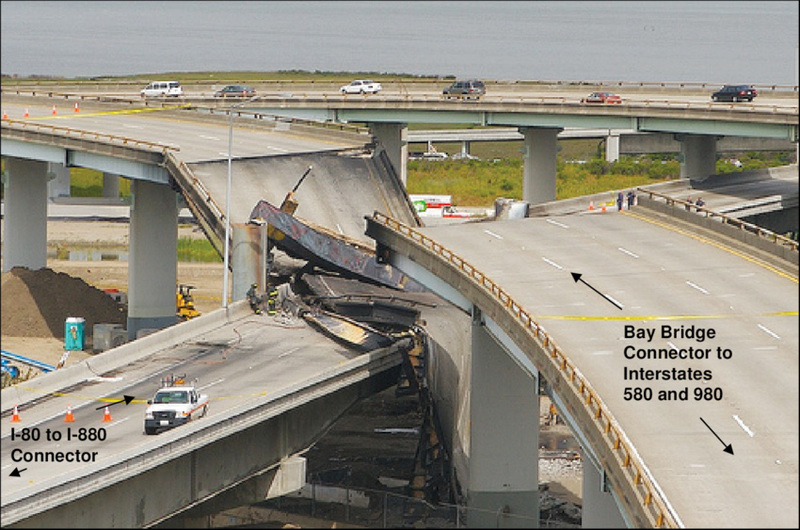 The petrochemical fire weakened the steel structure supporting the roadway, resulting in the collapse of the ramp connecting I-80 east to I-580. The original cost estimate for repair of the ramp was $10 million and a schedule that required the roadway to be out of service for several months, resulting in significant out-of-pocket costs to commuters and municipal agencies that provided free transportation on the local BART system. The State of California projected that the economic impact of the road closure was $6 million per day. Contrary to the initial cost and schedule estimates, the roadway was placed back in service on May 24, less than 30 days after the original accident, at cost below original budget estimates (the actual winning bid was $876,075 with an incentive of $200,000 per day if the work was completed before June 27). This rapid recovery after an extreme event was accomplished because the material and labor resources required for completing the project were immediately available. Engineers were prepared to address the design issues on an accelerated schedule, a contractor with significant experience in rebuilding damaged expressways had an existing relationship with Caltrans, and the material (steel) and fabrication resources were readily available to the project team. Recovery is the restoration of key operations as quickly and efficiently as possible after a disruption with the goal of a full return to normalcy within a short timeframe. It is impossible and impractical to design a building and structural frame to handle every potential extreme event. There will be times when even the most resilient of designs are stressed beyond the point of failure. In these cases, resilience is determined by the level of loss of functionality and the time required to resume full functionality. The level of recovery and the time required to accomplish it will be in direct relationship to the robustness, redundancy, and ease of repair of the structural system, as well as the availability of resources to complete the repair. Redundancy in the community context refers to the provision of backup resources to support key functional components of the resilient community. If a key component such as the provision of health services at a local hospital is taken offline, then a backup for that service should be identified to provide the service. For a building, redundancy can best be seen as the ability of the structural framing system and the material from which the frame is constructed to provide additional load- carrying capacity and the ability of the frame to transfer loads to alternative load paths. Structural frames constructed using structural steel consistently receive high marks when measured using the four Rs thanks to the inherent resiliency of steel. When resiliency is required in a structure, structural steel is the ideal choice. When developing emergency management and resilience plans, it is important to recognize that not all communities are alike. The stressors that could affect a community vary by location. For example, some communities may be located in areas prone to hurricanes, floods, and storm surges, while others are in places prone to snowstorms, wildfires, or tornados. Many areas are seeing an increase in storm intensity, hot and dry spells, and snow loads due to global climate change. Not all factors must be included when developing resiliency management plans and selecting building materials, but those stressors that have a measurable probability of impacting the local community must be considered. When determining resilience as it relates to the four Rs, a defined resilience scale is key. Without an appropriate scale, it is difficult for decision makers to determine ways to efficiently and effectively compare alternative approaches. The evaluation of resilience is a developing field with proposed approaches falling under either a subjective or objective methodology. Subjective evaluation of resilience ranks alternative design approaches or plans against each of the four Rs using a three-step ranking system: high, medium, and low. The alternative design approaches or plans are then assessed by the individuals involved based on their sense of the relative merit of each of the four Rs and a final rating given to each. The objective approach to quantifying resilience takes one of two forms. The first requires the individuals involved in assessing comparative proposals or plans prioritize each of the four R’s on a one to five scale (robustness and recovery might both be a five, while redundancy might be a three and resourcefulness a two) and then rate the level of each of the four Rs on a one to 10 scale. The priority level and rank are then multiplied for each R and added together for the overall result. A more analytical approach is to consider risk levels, cost of recovery, and length of time required for recovery for each type of extreme event. For example, if the probability of a 6.0 seismic event was estimated to be one occurrence every 50 years (0.02), the cost for repair to the building was estimated to be $10 million, and the time of lost occupancy was 120 days at a cost of $50,000 per day, then the resilience rating would be 0.02($10,000,000+120x$50,000) = $320,000. The overall rating would be the sum of all possible events. Structural alternatives are then compared with the lowest value indicating the greatest level of resilience. While this approach may seem arbitrary and overly complex, it is exactly the same actuarial approach used by insurance companies to set insurance rates for buildings. The most common types of structural framing materials are wood, concrete, and structural steel. Of the three materials, steel consistently ranks as the most resilient and cost effective. 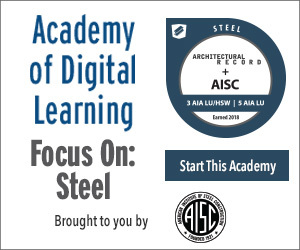 While the initial cost of a structural steel framing system may be higher for a particular project, its ability to withstand a wide range of extreme events while allowing the structural frame to maintain its integrity during and after a disaster is the model of cost-effective resiliency. Insurance policies are purchased by a building owner to cover damage, replacement costs, and loss of use of the building in the event of a disaster. Addressing resilience in the design of the building through the proper selection of the structural frame using the appropriate structural framing materials is similar to purchasing insurance on the building. Spending money up front to address resilience can mean the difference between having a facility up and running shortly after a disaster or waiting months for reconstruction. The best measure of resiliency then becomes a measure of risk. When determining how to quantify those risks, there is no need to look further than insurance rates based on today’s market for builder’s risk (insurance that insures the building during construction) and all risk (insurance purchased by the building owner insuring the building after occupancy). Insurance companies regularly assess the loss records of buildings subject to both anticipated and extreme events, and then they use those studies to set their rates. For a given set of risks, a lower rate means less likely damage and a lower cost of repair, providing an excellent proxy for comparing the resiliency of different structural framing materials. The simple fact is that the insurance rates for structural steel-framed buildings are significantly lower than the rates for buildings framed in wood or concrete. 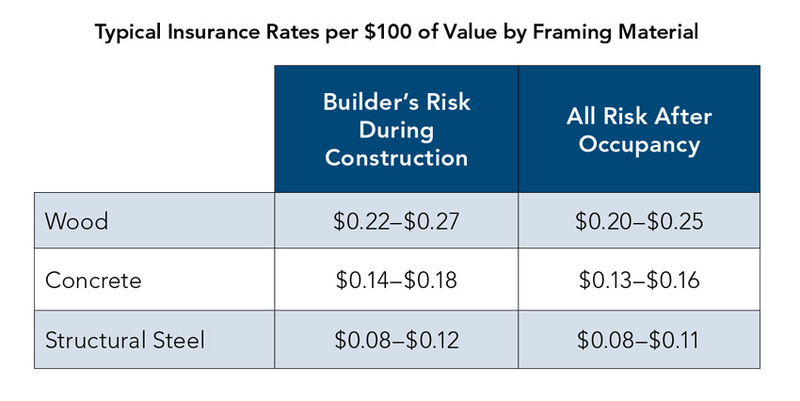 The chart below illustrates current insurance rates per $100 of value in today’s market for builder’s risk and all risk insurance. These rates represent costs for the same building in the same location, the only difference being the framing materials. The rates for structural steel are consistently lower than the rates for wood or concrete, both before and after construction. Since these rates are based on costs for the same building in the same location, they take into consideration the same external risk factors, including future impacts related to climate change. For example, in Florida, the risk could be based on calculations of a projected hurricane, storm surge, or flood damage, while in California, risk could be assessed based on calculations of projected wildfires or mudslides. These rates will change based on the project location and the particular risks associated with that locale. This also could change if the project has a specialized feature or aspect. Despite the fact that rates vary by location and project, the general trend is the same. Insurance rates for wood buildings are 2.3 times higher than for an equivalent structural steel-framed buildings, and the rates for a concrete building are 1.5 times higher than for a steel-framed building. The difference is not the level of risk to the building from an extreme event, but rather the resilience of the building in responding to that event. For a building valued at $100 million, the savings in insurance costs over a 50-year period would be $6.75 million for a structural steel-framed system when compared to a wood framing system. The actuarial studies performed by the insurance companies confirm that the structural steel-framed buildings are inherently more resilient than buildings framed in wood or concrete.